Thanks to David Crespy's intuition, a French Engineer visiting the Machu Picchu in Peru, Thierry Jamin, Archaeologist and Explorer, is about to make a major discovery at the most visited archaeological site in South America. PressRelease/ -- For more than fifteen years, Thierry Jamin, French Archaeologist and adventurer, explores the jungles of South Peru in every possible direction, searching for clues of the permanent presence of the Incas in the Amazonian forest, and the legendary lost city of Paititi. After the discovery of about thirty incredible archeological sites, located in the North of the department of Cuzco, between 2009 and 2011, which include several fortresses, burial and ceremonial, centers, and small Inca cities composed by hundreds of buildings, and many streets, passages, squares..., Thierry Jamin embarks on an incredible journey in Machu Picchu. A few months ago, Thierry Jamin and his team think they have realized an extraordinary archaeological discovery in the Inca city discovered by Hiram Bingham in 1911. This discovery was made possible thanks to the testimony of a French engineer who lives in Barcelona-Spain, David Crespy. In 2010, while he was visiting the lost city, David Crespy noticed the presence of a strange "shelter" located in the heart of the city, at the bottom of one of the main buildings. 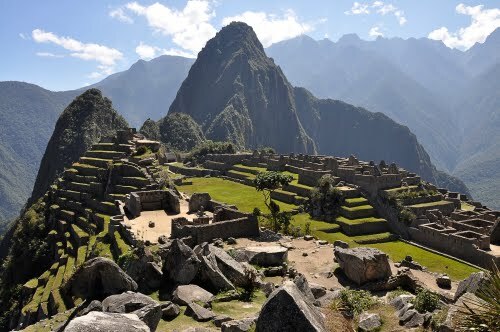 For him, there was no doubt about it, he was looking at a "door", an entrance sealed by the Incas. In August, 2011, David Crespy, found by chance an article about Thierry Jamin and his work in the French newspaper the Figaro magazine. Immediately he decided to contact the French researcher.